Yesterday I had to go out to run an errand. Seeing as how it was Saturday, and my husband and I hadn't spent any time together all week, he decided to join me. After finishing up my errand I said I'd like to take a drive along the beach. It had been over a month since I'd seen the ocean and that's way to long for this lady! Driving past Rye Harbor we decided to stop and grab a bite to eat. A cup of clam chowder seemed to fit the bill. It was good and hot on a dismal, cloudy day. After enjoying the chowdah we continued along to North Hampton beach where there seemed to be a lot of surfers. More than usual, though you can't really tell by my photos. 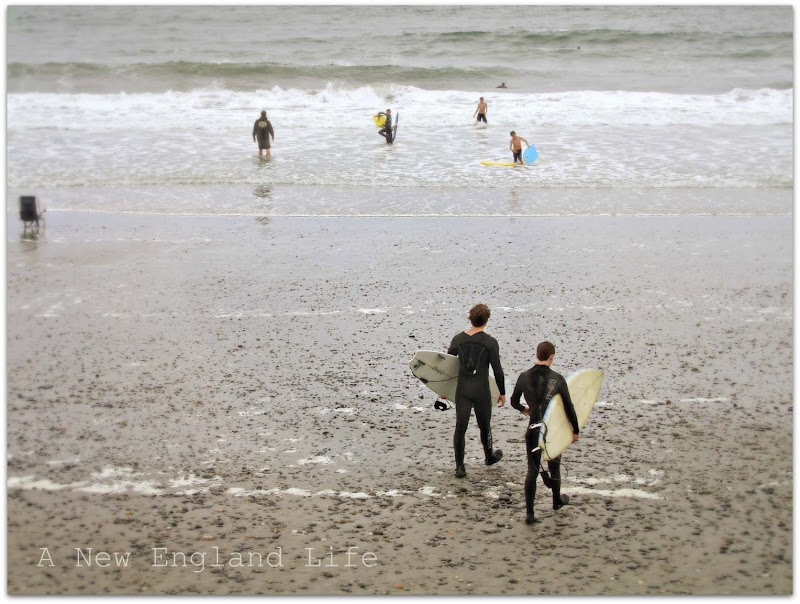 How anyone could get in the New England ocean water this time of year, without a wetsuit, is beyond me! I hope you enjoyed the afternoon with us. Wish you could smell the ocean. The salt air tends to have a healing effect on the heart and soul. I enjoyed the afternoon with you very much. The salt air does have a healing effect. Your photos are marvelous. Thank you! Love love love love love your afternoon...love it! I can smell it & taste it & I'm green with envy. 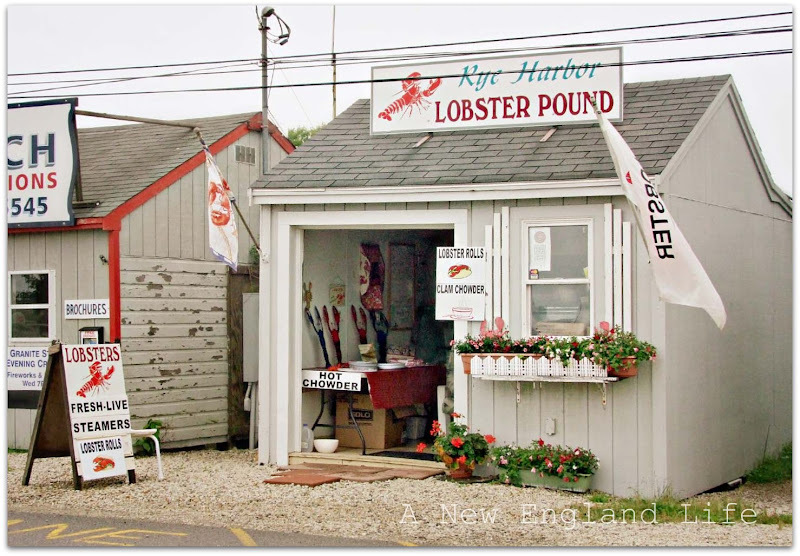 Wonderful, fun pictures of New England...having grown up on Long Island, and now living at the Jersey Shore, I can't imagine why anyone would want to live anywhere else. Oh man, Sharon. That chowdah looked scrumtious. I would have ordered a bowl of it! My post for Monday is also of the sea. Lovely ocean shots. Almost a vintage feel to them. And that chowder! Looks so thick, just like I like it! Yum! Your photos are great. My hubby would love that chowder! 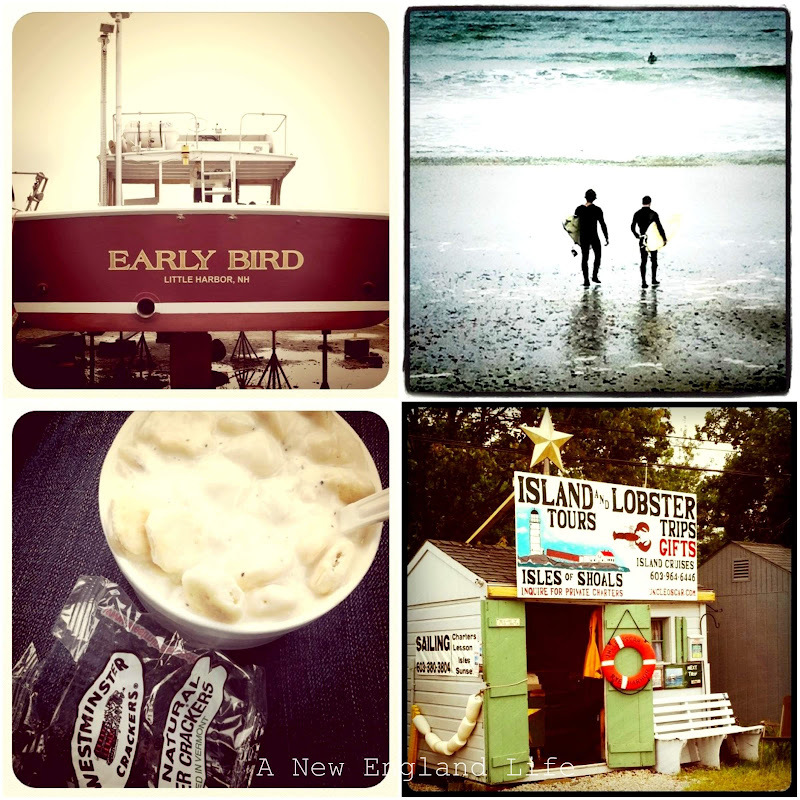 I share your love of the seabreeze and clam chowder. Be sure to stop by my blog Tuesday to enter my giveaway. 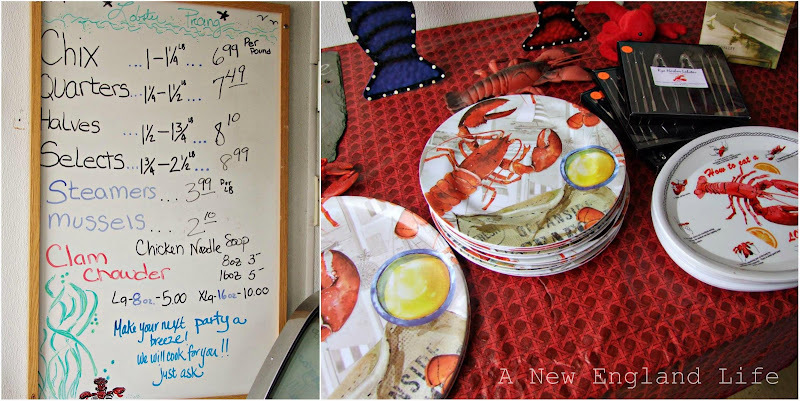 I love a good chowdah..and a lobster roll! I also love the boat ride out to the Isles of Shoals. Great memories of New Hampshire! happy Mosaic Monday! Thanks for sharing this lovely fotos! Sharon, sounds like you had a great afternoon! I can almost taste the clam chowder. Thanks for sharing! I know you don't see your life this way, but from your blog, it seems like you are always on vacation. How uplifting it must be to live someplace so constantly beautiful, both by the water and inland. You are most blessed indeed! Such a beautiful place! I miss the salty air! Thanks for taking me back! Your photos are soothing enough. They made me forget about the smells that are behind them. What bliss! What a heavenly day! I loved seeing the photos. I can almost smell the ocean AND the chowder! Oh! 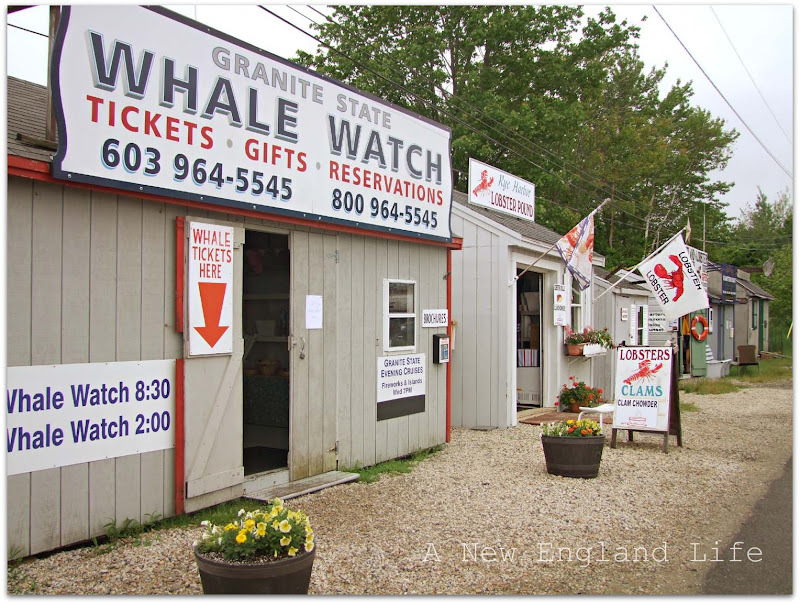 How I did enjoy my virtual visit to New England. I love your coastline and wish I could see it again in real life! That first image of the marina is so incredibly beautiful. I love it! And, I love your header too. Gorgeous colours. Thanks for sharing. Love that first shot and processing. So wanting clam chowder now! Gorgeous photos! Thanks for taking us along! You're right about the salty air! I love going to the beach to take in the beauty and the fresh air! Does a body good! I just want to jump right into your photos Sharon! I love the ocean and don't get to visit it nearly enough. It's always such a pleasure coming here, Sharon. I love your photos, and being able to see the ocean. Oh, to have the ocean that close to me. Just wonderful. Thanks for taking us along....great photos. I love the lobster in the window box! Sharon you live in a beautiful place and you sure capture the moments as they come to you . So much beauty. You take to me to another world from the Prairies of Canada. Stunning photos and the processing is new to me. I dont know how to do it . Would love to learn. Loved your blog once again. Beautiful photo series Sharon! Clam chowder sounds good today, fog, clouds and low 60's. I used to live where those famous Westminster crackers are made, Westminster, Mass. I'd love to live there in this area near my aunt and uncle in Rye. Loved your tour, thought you might have stopped at Petey's. My niece loved this place so much when we were there in October, she and her boyfriend moved there about 6 weeks ago. I'm so jealous I can't stand it. To be young and have a chance to live life in lovely New Hampshire. 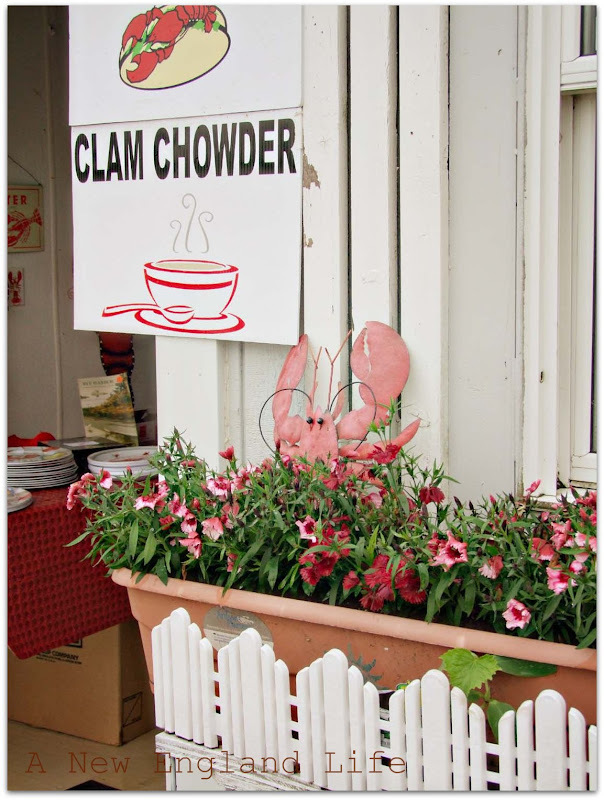 Feel free to send over some of that clam chowder! Yikes, that water looks cold! 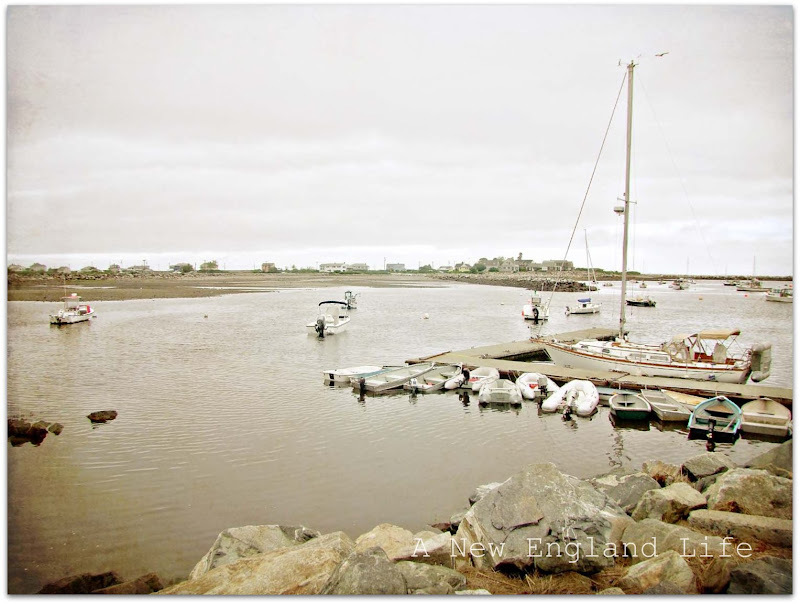 I have been working on a romantic novel that takes place in Maine...the photos you take and post help me gather in the atmosphere and sense of upper New England. I will most definitely give you some credit for the inspiration in photos in my book. Thank You...the book will be entitled " Six Weeks in New England". I simply MUST visit your nook of our country...it just seems fairytale like to me by your wonderful photos! !